This Kreature uses its array of sensitive barbels to detect the electromagnetic fields generated by living organisms, allowing it to find its prey in murky water. The thousands of electrocyte cells packed into its long, muscular body allow it to generate devastating electric shocks. In battle, it will constrict its opponents and unleash one electric shock after another at point blank range. The coat of mucous on its skin isn't just slippery, it conducts electricity, making this attack even more devastating. After spawning, this Kreature will swallow its eggs to protect them; when they hatch, they'll swim out of their mother's mouth to freedom. I’d definitely want one ! 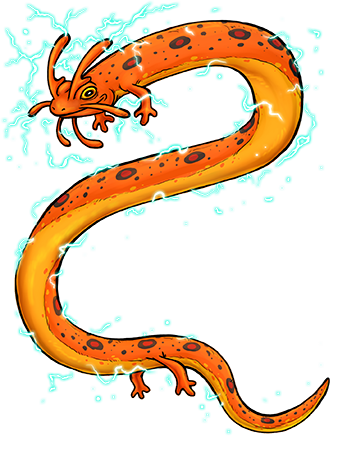 Although the electric slime may be a slight problem…..
Long, slippery, electric, and has vibration detection…. I ain’t gonna say it.